Eye: worsted weight yarn, small amount of black. Or Black 3-D paint. 2. 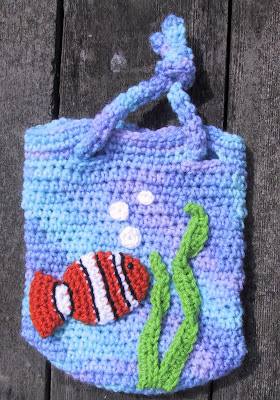 Instructions are written for using two colors of yarn, the bag with the embelishments was made using only one color, Red Heart Ocean. The other is made with Ocean and Delft Blue. 3. The bag should be worked in a fairly tight stitch. You may need to use a different sized hook to get a suitable stitch. 4. I cut the yarn for the color changes. It could be carried up without cutting, but since I wasn’t going to line my bag I cut the yarn and wove in the ends. 5. When joining with a slip stitch, pull the stitch tight until it almost disappears. 6. When joining a new color, complete the joining slip stitch with the new color. 8. When you make the strap, to avoid strangulation, don’t make it long enough the child can put their head through it. Change to main color and work remainder of bag. Round 1: With G hook ch 2, 5 sc in second chain from hook. Do not join. Round 2-until 22 inches or desired length long: Sc in back loop of next sc. Continue working sc in back loop until cord is 22 (gently stretched) inches long. You will be working from the inside of a tube. Weave tail through the 5 sc and pull snug. Fold bag flat with holes aligned. Weave cord from the front through two holes, across the back and through the other two holes back out to the front. Tie ends in an overhand knot. Work one of the fish from the Learn Your Colors Fish Counting Toy in color of your choice. The stripes on the fish in the photo were worked in this color order. 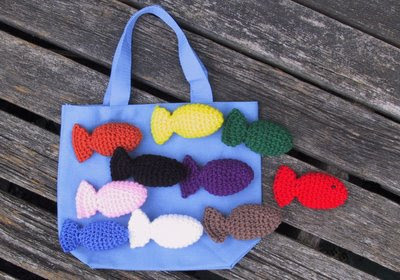 The black stripes are the stitches used to sew the fish to the bag. Leaf 1: Leaving a long tail for sewing, ch 25, slipstitch in 2nd ch from hook, sc in next 2 ch, hdc in remaining chains.Fasten off leaving a long tail for sewing. Leaf 2: Leaving a long tail for sewing, ch 18, slipstitch in 2nd ch from hook, sc in next 4 ch, hdc in remaining chains.Fasten off leaving a long tail for sewing. Sew the strands of seaweed to the bag. Give them a twist as sewing as shown in the photo. I started with the base of the seaweed on round 7 of the bag. Small bubble: Using E hook and baby yarn, ch 2, 5 sc in second ch from hook. Fasten off leaving a long tail for sewing. Medium bubble: Using F hook and baby yarn, ch 2, 6 sc in second ch from hook. Fasten off leaving a long tail for sewing. Large bubble: Using G hook and baby yarn, ch 2, 8 sc in second ch from hook. Fasten off leaving a long tail for sewing. EYE: Make a French knot for eye. Or use 3-D paint. The photo shows the eye made with the 3-D paint.